For many people, purchasing life insurance is a once-in-a-lifetime event. They consider their debt, income, and savings; then they determine how much coverage they need. This tends to be a final decision, since they anticipate that their income and lifestyle will stay fundamentally the same throughout their life. Physicians are very different - their lives and careers tend to be dynamic and may change more. Periodic reviews of your life insurance coverage are important and recommended. How long has it been since you have analyzed your family’s life insurance needs? Perhaps your circumstances have changed and you have not yet taken note. It is wise to pause and ask yourself: Has my life insurance coverage kept up with my income? Has it kept up with my financial obligations? Has it kept up with the cost of fulfilling the dreams I have for my family? Years of medical school and training cause physicians to carry substantially more debt than the average person - especially early in their careers. When you enter the workforce after medical school, you must work hard to pay off medical school debt and catch up financially. Through the years, your income will grow - sometimes steadily, sometimes dramatically. Have you recently transitioned from residency into practice? Have your years in practice continued to grow, and along with them, your income? If your income or debt has changed, it’s important to see if your life insurance coverage will still properly protect your loved ones' needs and future. Many graduate from medical school and follow a planned career path, but that path often changes. When you move from one hospital to another or switch to or from private practice, your income may change - and with it, your life insurance needs, even in ways you may not expect. For example, if you now have a partner in a group medical practice, you may want to consider taking out a policy on your partner. Life insurance is a straightforward funding option in case your partner should die and you decide to buy their share of the practice from their heirs. Or, if you and your partner(s) have taken out a loan to improve your practice, life insurance may be a practical way for each partner to guarantee that their portion of the loan will be paid if something happens to them. When your career changes, reevaluate your life insurance needs. At a minimum, if you have purchased a life insurance policy early in your career, your coverage will need to be updated as your income most likely has increased and you have more to protect. Common life events can also have an impact on the amount of life insurance you need. Getting married, purchasing a home, and having children bring greater responsibility. If something should happen to you, proper life insurance coverage will ensure that your loved ones will be cared for. It will make certain that they are able to stay in the home you shared together. It will turn the hope that your children will receive a quality education into a secure promise. Life insurance is a sure way to know that the ones closest to you will always be comfortable and secure. Life insurance can also play a key financial role as you plan for your retirement. For example, you may require life insurance for estate planning needs rather than for income replacement. If you no longer have a mortgage, have no children at home, or have become financially independent, you might need less coverage - but it is important to have trustworthy advice on the matter. Knowing whether you have the most suitable type of life insurance and appropriate amount of coverage can be a challenge. It helps tremendously to have expert guidance when choosing your life insurance policy. As a TMA member, you have that help ready and waiting – whenever you need it. If there have been changes in your career, finances, or lifestyle, now is the right time to have your life insurance policy reviewed to ensure that it provides the best fit for your family’s current situation. 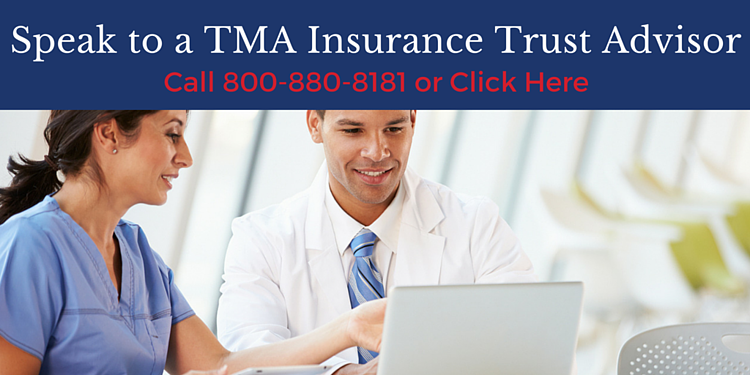 When you speak with a TMA Insurance Trust advisor, we can review your current life insurance policy and be sure you have the right coverage. No matter what changes your life or career brings, TMA Insurance Trust is here to protect what you’ve worked so hard to build. Contact one of our life insurance advisors for a consultation. With years of experience in helping Texas physicians, they can provide valuable, expert advice.